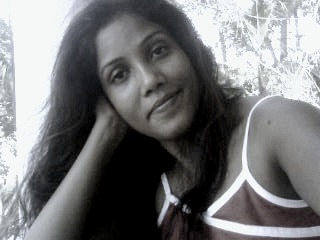 Stella's Musings: Clean India: There's No Glory in Being Stupid! Clean India: There's No Glory in Being Stupid! Last week I was in north Karnataka. One of the biggest attractions there is the dam over river Tungabhadra which provides water to several districts of north Karnataka and neighboring Andhra Pradesh. I was told that this is a must-see and they were right: the dam was truly beautiful. But every time I crossed over one of the branch canals of the dam, I saw it littered with trash. So, there were people bathing, washing and drawing water from the canals for their other needs while also throwing their trash in! How disgusting! I returned from the trip yesterday and saw the trash collector with her van. 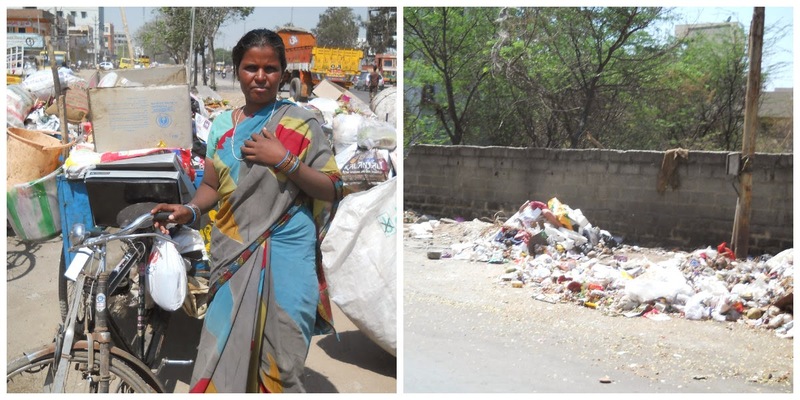 The woman - employed by the municipality - comes 3 times in a week and collects the trash. We have to pay her 50 rupees which is actually less than what a packet of cigarettes (about 90 rupees) or, a large bottle of Coke costs (80 rupees). But every time the woman comes, she collects trash from only a few families in our lane. The reason? Others are not ready to pay her 50 rupees for trash disposal. And these are educated people from fairly well to do families! So, how do they dispose their trash? Well, they go out in the evening with a bundle of trash ( a plastic bag) and throw it by the roadside. Sometimes, the trash collectors stop by and pick them up, sometimes they just rot there. Often, dogs tear them often, if they smell meat or fish. Is it any less disturbing than seeing villagers dumping trash in a canal? I was thinking this when an advertisement of the "Swachh India" campaign popped up on my TV screen. 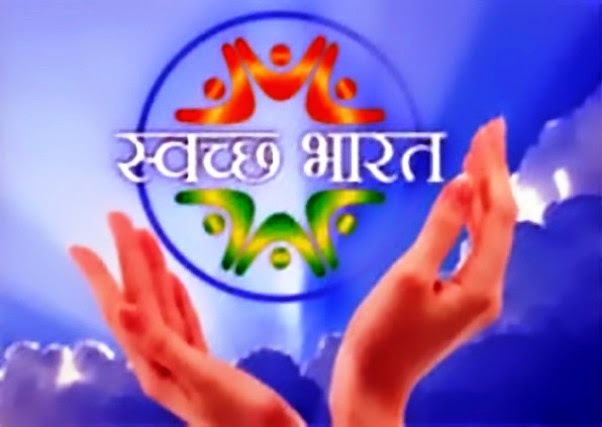 Launched on October 2, 2014, ( birthday of Mahatma Gandhi who believed cleanliness is godliness) by the government of India, this is a campaign that aims not just total sanitation for India, but also bring a behavioral change among Indians regarding sanitation. Now, it has been 7 months already since its launch and I don't really see any behavioral change, at least in the urban India, regarding what's clean and what's not. The urban men still pee in the road even when there is a pay toilet nearby, women encourage their small kids pee/poop by the roadside (as if being small makes their urine/excreta any less harmful) and everyone - men, women and even kids included - spits out saliva and phlegm on the road without a second thought. But many of these same people are always ready to criticize the government for not doing enough or mock campaigns like Clean India. Yes, of course, the government can do a lot more to add some more teeth to the campaign. For example, the campaign can create a number of hard-hitting messages, targeted at different groups: young men (who frequently pee on road), housewives (who won't stop their kids from peeing in the open or, those refuse to pay for trash collection) elderly citizens ( who beat others in spitting cough) and children. How about holding a cleanest street contest or similar incentives? But, honestly, the onus is ultimately on you, me, him/her and them. Venkaiah Naidu - the minister for Urban Development whose department runs the Swach Bharat campaign said that clean India was less about toilets and more about changing one's mindset. Our ministers are famous for speaking cliches and rhetoric. But this is one cliche that we really must pay heed to: we really, really do need a change of mindset when it comes to cleanliness. We need to remember that the world doesn't begin or end with our courtyards. If you are throwing your dirty trash on the road, you are also going to walk on it. And if there's a disease spreading, you can't be immune to that either. Also, when you throw trash in a water canal, are you not also endangering your own health? Of course we can go on playing deaf like devil may care. Only, there is nothing very glorious about being stupid, is there?